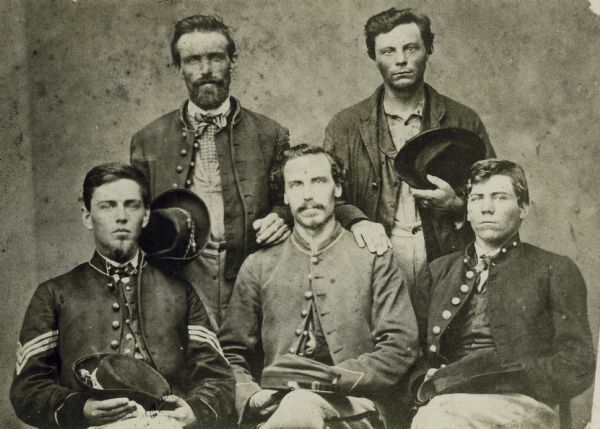 Five members of the 1st Wisconsin Infantry, Company C, who enlisted in 1861, were captured at the Battle of Chickamauga, and escaped together from a Confederate prison. From left to right standing: Joseph Leach and Lemuel McDonald. From left to right sitting: Chauncey S. Chapman, Thomas Anderson, and John R. Schofield. This photograph was probably taken after their escape, when they were reunited in Cincinnati at the soldiers' home there. To see a 1914 newspaper article describing their escape from prison, go to www.wisconsinhistory.org/wlhba/articleView.asp?pg=1&id=14702. To see the roster of their company, go to http://www.wisconsinhistory.org/roster/results.asp?image_id=1471.